Scott Smith of School Master Ministries preaching at WVU. MORGANTOWN, WV – The first stop on the 2017 ACM Fall College Tour was West Virginia University. Andy Schmelzer had regularly preached there before, so we had an idea of what we were getting into. We started the day of without amplifiers preaching the Gospel from atop a small wall that holds shrubs. Across the walk, we had the prayer stand up with a variety of Gospel tracts and Bibles. The idea was to take a two-pronged approach. Open-air proclamation on one side and a less aggressive approach on the other with the prayer stand that typically fosters great one-on-one conversations. As the preaching started, small groups of students would stop and go. The traffic to the prayer stand was also pretty steady. 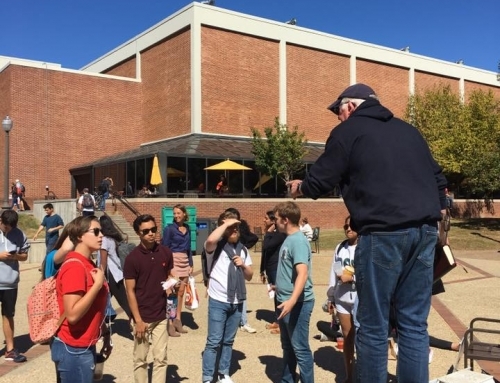 While those two areas were being used, those not involved with either floated around and distributed Gospel tracts and ministered to students face-to-face. Towards the end of the afternoon, brother Don Karns “Evolution Is A Lie” sign drew much ire from the student body and the heckling began in earnest. Shortly after, the crowd began to grow to a large size as the classes would dismiss. 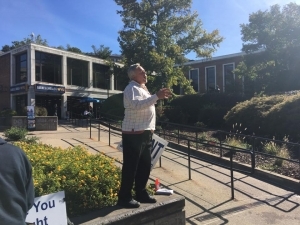 Brother Mike Stockwell took the wall and boldly proclaimed the Gospel to an already fiery crowd. Within minutes, homosexuals wrapped in a rainbow flag were standing on a nearby wall with strong objections to the message of the cross. These students were in addition to the flat earth hecklers that Don had already roused up. To complete the powder keg, 3 Muslims made their way to the front of the crowd. 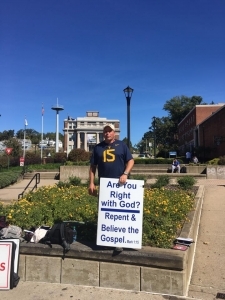 Mike Stockwell of Cross Country Evangelism preaching at WVU. 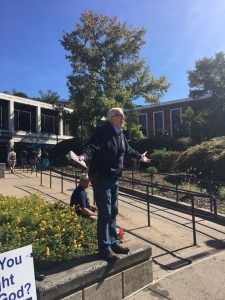 Mike did a wonderful job ministering to all 3 groups of hecklers simultaneously while enduring much hate and profanity. Just another day at the “office” it seemed as the crowd continued to whip into a frenzy. Much like a feeding frenzy sharks get into when they smell blood in the water, the students continued to feed off one another working themselves up to a roar. 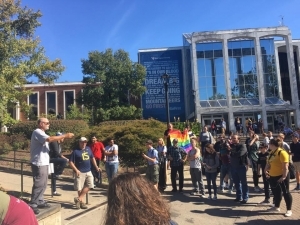 While this was taking place, as throughout the day, Adam was approaching students he sought out that were listening to the message being proclaimed. He took part in many conversations with students whom some agreed, some disagreed, or just weren’t sure about the Gospel message. By approaching folks one-to-one, it provides another dimension to open-air ministry that is sometimes even more effective than the herald on the box. That is, it allows a person to open up in a way he or she may not say if they were conversing with a herald in front of a crowd. Both methods are effective and we were blessed to have men who could do both. One aspect of tours like this with multiple brothers from other ministries that is profitable is the ability to learn from others. I tried to spend time each day of the tour eavesdropping on others to learn how to be more effective. 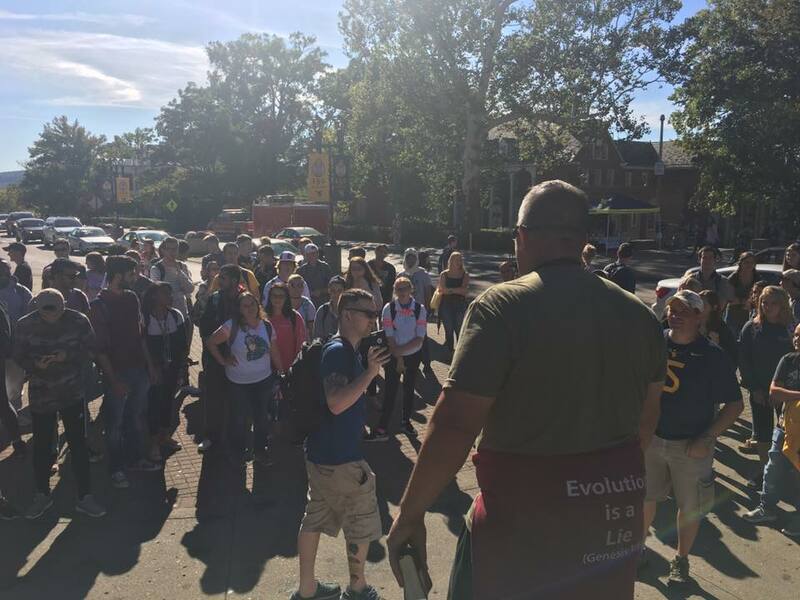 As Mike was preaching, I noticed Don speaking with a group of students that were remnants of his pro-evolution “fans”. I was anxious to sit next to him and listen and learn. However the Lord had other plans. Don Karns preaching at WVU. As I sat down next to Don, a young lady approached me with what appeared to be an aggressive demeanor. She asked if she could talk to me and I obliged. Her first question was, “What does that mean if you’re a Christian and you are indifferent to those around you living in the homosexual lifestyle? Does that make you a bad Christian? Or does it mean you’re even a Christian at all since it doesn’t bother you?” I sensed she was seeking in someway to hold on to her Christianity in one hand, while holding on to her friends lost in the homosexual lifestyle in the other. I explained to her that as Christians the Bible is our authority. And as our authority, I would not apologize for what it teaches about homosexuality. After a quick run through of related passages, I made my way to why we discuss such things with the lost. The second greatest commandment tells us to “love our neighbor as ourselves” (Mark 12:31). In that spirit, the most loving thing we can do is to love our neighbor by warning them about the dangers to come should they die in an unrepentant state of homosexuality. As I continued, I also steered the conversation back to the Gospel. I walked her through who God is, the law, our broken state and need for a Savior, and what happened on the cross that made that possible. It is likely this was the first time she had heard the complete Gospel message. This young lady who aggressively approached me within minutes was melted into a puddle of tears by the proclamation of the Gospel message. And not only that, but as we were later driving home, I was informed she was one of the most vocal, hate-filled hecklers of both Andy and Don as they preached. God melted her to tears. She asked for a Bible and went on her way quietly. Pray for Mackenzie. Jimmy Hamilton preaching at WVU. As I left her and made my way back to Mike who was still encouraging the now even larger crowd, I was met by an inquisitive young man who had one of our Country Roads tracts wadded up in his hand. He was open to listening to the Gospel message but said he walked away from the faith because he could not reconcile how God could predestine someone for Hell. We talked for several minutes and after some explanation, he took another Gospel tract and agreed to at least consider the truths of the Gospel. Please pray for Austin. 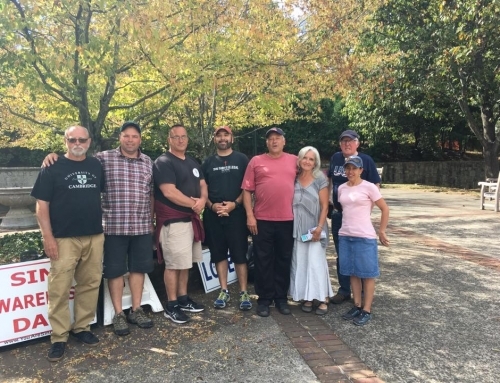 I continued making my way back to the center of what could now only be described as a hornet’s nest as Mike continued to poke with the Gospel truth. After about another 10 minutes, I was going to finish up the day, but we decided it was best to start making our way out. However, I was able to talk with a homosexual and 3 Muslims who were leading the raging crowd. After explaining to the homosexual the differences between priestly/ceremonial, civil, and moral laws of the Old Testament (view video here) and why only God’s moral law still applies today, he seemed to calm as his errant accusations were gently exposed. His arguments were ones we hear quite often when someone tries to justify the homosexual lifestyle by equating it with eating shellfish or wearing clothes of mixed fabric. Before he could take us down another rabbit hole, I was able to give a brief explanation of the Gospel and why that’s our greatest need. Pray for Dylan. Andy Schmelzer preaching at WVU. As I finished with him, the 3 Muslims who were some of Mike’s biggest “fans” were still hanging around. They listened to the Gospel message that I explained to Dylan, so I had some room to chase a few thoughts before we left. As I explained the incorrect view that Muslims have of Jesus (that is was just a prophet), they continued to become increasingly frustrated. However, the conversation continued (view video here) without incident and by the end, the most outspoken one actually hugged me as I tried to shake his hand! Though he likely is still unconverted, he did hear the Gospel and the truth of Christ being God. Pray for Ali. As we left WVU we were exhausted from the labor and heat. Brother Adam Felder and family graciously treated the team to a wonderful Italian meal from a local restaurant and we settled into our nightly routines as we prepared for an uncertain day a Marshall University. 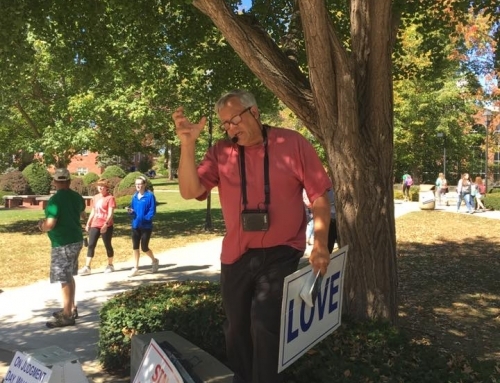 A couple Pelagian hate-preachers had visited the campus a week before. Our prayers were in abundance that the Lord would do a mighty work the next day.